My path to yoga came via a decade as a human rights advocate, an activist and a humanitarian worker. Amongst other things, I needed to learn the lessons of yoga in order to make my activism more compassionate and sustainable. These days I see no separation between my yoga and my activism. In both I peel away the layers I’ve built up between my heart and all beings. In both I learn patience, acceptance and the transformative power of compassionate clarity. These days, my activism is part of my yoga. That’s why I’m thrilled to help bring Off the Mat, Into the World® (OTM) to New Zealand. OTM is an organization committed to bridging yoga and activism. 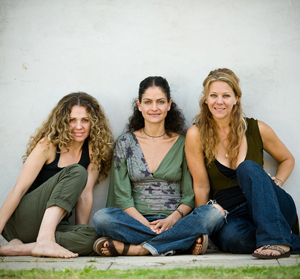 Yoga teachers and social champions Seane Corn, Hala Khouri and Suzanne Sterling started OTM because they see the potential of the yoga community to take what we do on the mat into the world to make a difference. OTM uses the power of yoga to inspire conscious, sustainable activism and to ignite grass roots social change. We do this by facilitating personal empowerment through leadership trainings, fostering community collaboration, and initiating local and global service projects. I’m the Regional Leader for OTM in New Zealand and Australia, which means it is my job to find out how OTM can support our local yoga community to take our yoga off the mat and into the world. We’ve already had a couple of OTM Yoga in Action trainings here in Wellington. These courses are unique and powerful experiences. They facilitate self-exploration and radical transformation, development of communication and leadership skills and visioning to action. Our goal is to use the power of yoga to help people become effective and sustainable leaders in their service or activism. Together with Kelly Fisher (of Yoga Unlimited) and Nick Potter (a committed Astangi who has recently spent 3 months in Mysore), I’m planning another Yoga in Action course for October/November this year. If you think you might be interested or want to know more, please get in touch (my contact details are at the bottom of this article). Fundraise for a good cause – take their practice to the next level by fundraising for Off the Mat, Into the World. This money goes directly to supporting our efforts to develop leaders, build community and initiate local/global projects that make a difference. Raising $108 over the month of September is a gesture of commitment and action AND the collective impact of all of our efforts will be significant. Julia Baker, a local Wellington yogini, is our Yoga in Action month co-ordinator and she’s ready and willing to support any one who wants to take up the challenge of raising $108 in September. She has suggestions of ways to raise the money (my favourite is getting friends, work mates and family to sponsor your 108 sun salutes at a local Global Mala event) and a publicity kit with postcards and other information. Donation yoga classes are another great way to raise the money. Personally, I’ll be raising my $108 through my Yoga Sangha ‘pay-what-you-can’ classes in Wellington. Special offer: As a sign of appreciation to anyone who steps up for the Yoga in Action challenge, I’m offering a free place in my next ‘30 days of yoga’ online course to anyone who raises $108 in September. This course usually costs US$100 and it is a great way to establish, or re-establish your own unique, authentic and sustainable home yoga practice. It makes a beautiful compliment to regular yoga classes. Also – if you are involved in any kind of yoga-related community project please get in touch, OTM is here to support whatever great projects or organizations are already out there. Whether you are running yoga classes for at-risk communities, bringing yoga to schools or prisons, teaching free yoga or introducing yoga to people recovering from illness or addiction, we would love to be able to support you.